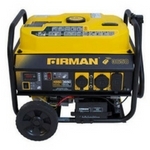 Power your tools, lights or camping equipment easily with this Firman 4,550W Peak/3,650W Rated Gas-Powered Portable Generator with Remote Start. With the press of a button or pull of the recoil, you can fire up the generator to provide 3,650W of running power and 14 hours of operation on a full tank of gas. The Firman Max-Pro Series OHV engine is cast iron-sleeved and boasts automatic low-oil shutdown for added durability. Our rugged and reliable 9000-watt generator with included engine oil features Intelligauge to monitor output and Volt Guard™ to prevent overloads. 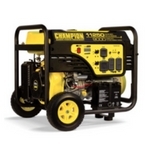 The 459cc Champion engine with electric start and included battery have all the power you need for home backup during an outage or your next project.